He might as well be saying it to the viewing audience, not as banter but as a gentle taunt. “My condition,” for Mr. Fox, is Parkinson’s disease, and his new series, which has its premiere on Sept. 26 on NBC, doesn’t just work it into the show. It basically makes a character out of it. Several series in the new season continue the welcome advance of characters with disabilities or severe medical conditions on television, but “The Michael J. Fox Show” takes things to a different level. It’s a fictional series wrapped in Mr. Fox’s personal reality show. With our natural tendency to want to feel as if we’re part of something groundbreaking, it’s easy to forget that characters with disabilities have been turning up on television for a long time. That is underscored this season with a new version of “Ironside,” a series about a detective who uses a wheelchair, which arrives on NBC on Oct. 2. The original “Ironside,” starring Raymond Burr, made its debut almost half a century ago, in 1967. Since then, television has brought us blind investigators (“Longstreet” in 1971, “Blind Justice,” in 2005) and a so-called defective detective with obsessive-compulsive disorder (“Monk” in 2002), not to mention a paralyzed convict (Augustus Hill on “Oz” in 1997). Mary Ingalls lost her sight in “Little House on the Prairie” back in 1978. Before it was a Broadway hit or an acclaimed film, “The Miracle Worker” was a teleplay, on “Playhouse 90” in 1957. And Mr. Fox is far from being the first actor with a disability or serious medical condition to play a character with that challenge on television (though advocates argue that this kind of casting doesn’t happen nearly often enough). Jim Byrnes, a double amputee, was a featured player on “Wiseguy” in the 1980s and “Highlander” in the 1990s, among many other credits. Chris Burke, who has Down syndrome, played a son with that condition on “Life Goes On,” a domestic comedy that ran for four seasons beginning in 1989. When Dana Elcar, an actor on “MacGyver,” developed glaucoma and began to lose his sight in the early 1990s, the series had his character experience the same thing. On AMC’s “Breaking Bad,” R J Mitte, who has cerebral palsy, portrays Walter White Jr., who has that condition. When we first meet the new “Ironside,” played by Blair Underwood, he is beating information out of a man detained by the police; later he and his girlfriend steam up the screen with a love scene. In the opening moments of “Growing Up Fisher,” a domestic comedy NBC has slated for midseason, a father (J. K. Simmons), who is blind, cuts down a tree with a chain saw. In “Mind Games,” a new ABC show, Steve Zahn plays a bipolar man who, with his brother, runs an agency that uses human-behavior research to alter clients’ fate, the latest in a glut of shows since “Monk” in which conditions like Asperger’s syndrome and obsessive-compulsive disorder are disruptive but not debilitating. The actors in these series do not have the disabilities they’re portraying, something also true of Kevin McHale (Artie on “Glee,” D J Qualls (Billy on “Legit”) and others. Advocacy groups continue to complain that few such roles go to those with the impairment being depicted. They also emphasize that the number of characters with disabilities on television is still far short of reflecting real life. Mr. Fox’s new series lives in a different universe from all those debates. He not only has the disease that his alter ego, a television newsman named Mike Henry, has, but he is also surely the most famous Parkinson’s patient in the world. He was one of Hollywood’s more beloved stars long before he announced that he had the disease in 1998. And since then, he has been fearless in talking about Parkinson’s, using his fame to put its symptoms and effects on display and emphasizing what he can still do rather than what he can’t. All of that is rolled into his new show. He and the writers know what you know about Mr. Fox and how you are naturally inclined to feel about it — that condescending mix of sympathy and pity and discomfort that any disability brings out in those not directly affected by it. And they take advantage of all of it. The pilot is just as aggressive as the other new series in showing what someone with a disability can do. But there is a lot more going on. The episode involves Mike’s decision to return to work at NBC, which he left because of his Parkinson’s. The man trying to coax him back knows what a ratings boost Mike would bring, and Mike knows exactly how NBC would promote his return — that is, with manipulative schmaltz. 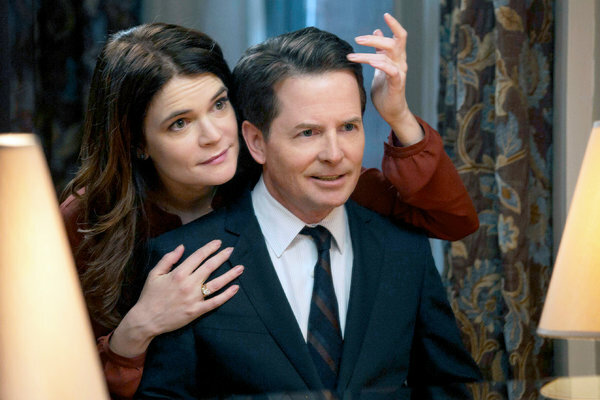 Mr. Fox has used his Parkinson’s to good effect for a couple of guest spots on other shows, most notably a recurring role as a lawyer who plays up his symptoms to win cases on “The Good Wife,” but “The Michael J. Fox Show” pilot goes well beyond that. It’s head spinning in its meta-ness. It’s about Mike Henry and his Parkinson’s; about the fictional world of the show reacting to Mike and his Parkinson’s; about Mr. Fox forcing you to react to his Parkinson’s; and about NBC letting you know that it knows that there is a certain amount of string-pulling in forcing you to react to Mr. Fox’s Parkinson’s.